Description: The Pull & Go Folio is a complete storage solution for all of your accessories, game cards and Nintendo 3DS system. 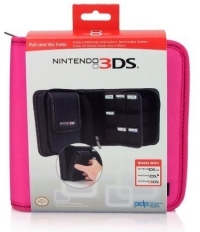 Featuring a removable system case that is designed to hold a Nintendo 3DS, the Pull & Go Folio also includes a mesh pocket for both an AC adapter and car charger, pockets for up to 29 games, and a slot to store an extra stylus. The case zips shut for easier transport and better protection. This is a list of VGCollect users who have 3DS Pull and Go Folio Case (Black) in their Collection. This is a list of VGCollect users who have 3DS Pull and Go Folio Case (Black) in their Sell List. This is a list of VGCollect users who have 3DS Pull and Go Folio Case (Black) in their Wish List.